Discussion in 'General Self Defense' started by FriedRice, Sep 14, 2018. It does matter who your opponent is, if you bite his finger off, the fight will stop right there. Your opponent will run to the EM to connect his finger back before it's too late. Of course biting work. It's more psychology than physical. To lose some body part for the rest of your life can scare you enough even if you are a tough guy. No. I mean, you can try to bite an arm or a leg, but I don't think that's going to help much. Best results I've seen from biting is going for the face or ears, but I don't think that was an option here. Typically untrained people on top don't realize they're in danger and believe that they're winning the fight. By the time this guy realized he was in trouble, he was already heading towards snapsville. If you notice, the guy on top fell right into the Omoplata. No amount of biting or "dirty tricks" can help you if you don't realize the set up. In a fight with the adrenaline pumping biting is not as effective as one would think. When I was around 20 I got in fight one night that ended up going to the ground. The guy biting me just made the beating I gave him worse. Not proud of that moment but a good example that biting often times does not create enough pain compliance. No bitting wouldnt have stopped the broken arm, you would however have a slightly different result, that one has a broken arm and the other has a chunk of flesh missing, so it would have worked to the extent that you had inflicted more damage on the Attacker. In less dominent situation bitting can change the dynamics of the fight, as they become very careful were they put their limbs, or break Off from what they are doing, in order to recue a finger. Is it just me, or was that the strangest real fight I've seen. I mean what was going on here? I saw two guys grappling at a moderate pace on the floor with mellow music playing in the background, a group of mostly disinterested people enjoying themselves at the bar and scarcely paying attention, and people just walking by like this was the most normal thing in the world. It wasn't until the one guy really started to crank on the other dudes arm that I was sure it was serious. And even afterward, with the guy's arm all messed up all the bystanders were so ...strangely relaxed about the whole thing. Very bizarre. Oh... and I don't think biting would have helped his arm. Unless you mean biting down on a firm padded object like a piece of wood or a wallet to help keep from screaming in pain? Yeah, maybe that! Probably just a random street fight outside a bar. In some parts of the world that stuff is common so people just walk by. That was some nice music though. As your arm is about to break and up to the point of it actually breaking and the excruciating pain that follows continuously....you will release your bite to scream, probably at the beginning. Therefore, as the lock is tight and being cranked, the pain with go from 0-8/10 very quickly and you should open your mouth to scream. Then it's 8-10/10 as it breaks within 1-2 seconds. When you bite, then your head is committed to being stationary = better chance for me to scoop out both of your eyeballs. That's just Rugby and not fighting vs. trained fighters. And did you get kicked out of the game & banned for being a weirdo? I would hope that the other guy at least fought you for this or pressed charges. Or was this an imaginary story? Nah, adrenaline. The break will continue and you'd more likely open your mouth to scream as your arm cracks and then you may pass out from the pain. The pain is different and more bearable from a bite. While a broken bone, any movement or disturbance after the break, is excruciating. I've been bitten by German Shepherds, and they have way more biting power than humans. It didn't even hurt that much due to the adrenaline....just a lot of shock seeing a gnarling dog coming at me like a rocket and latching on. I know this one crazy ***** who almost bit off a finger joint of a female cop while resisting arrest and this Cop continued to smash her face in with the other hand, then started kneeing her in the face. They were both husky broads. This guy got half of his ear bitten off and was still game to continue the fight. No expression of pain was shown neither. Rugby players are trained fighters, they train to fight for the ball ????? Evidently, that would impress those who can't fight. And whats your defintion of " cant fight"
My first BJJ coach (who also competed in Muay Thai and MMA), used to play rugby. He was unambiguous in his opinion that rugby counted as a martial art. When your (general YOU) finger is separated from your hand and if you still have the "adrenaline" to continue, you are not a tough guy but a stupid guy. I would prefer to have my arm broken 10 times than to have a missing finger for the rest of my life. When your finger is gone, it's gone. I have just removed a losing finger picture from this post. Even when I look at it, it can upset my stomach big time. I don't want that picture to upset others here. Believe me, it's not a good feeling when you look at your hand and you can see one finger missing. You're more stupid if didn't continue to break the arm after being bitten because there's no guarantee that just b/c you let go of the lock that he'd stop biting. And the arm was about to be broken anyway, in about 1 second. Getting a little melodramatic aren't we? You clearly missed the point of this post + video. The omoplata was already secured. At the point when it started to hurt, then it was about to break in a few seconds. And how is he going to reach for the fingers with his teeth? You do know what a shoulder lock is right? It depends on whether you have your own teeth or not. Beginner level - get a raw pig leg and sink your teeth through the fresh and all the way to the bone. Intermediate level - Try to bite a life snake's head off, or a life dog's leg off. Advance level - Go to a zoo and test your biting against a tiger or lion. 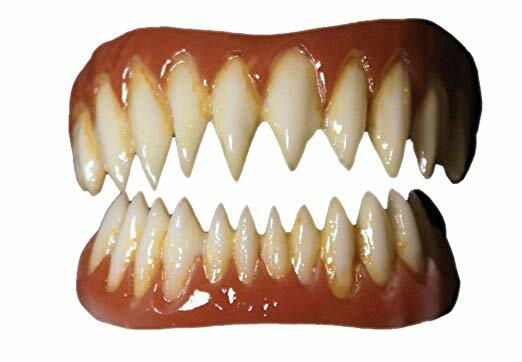 You will then have teeth like this.